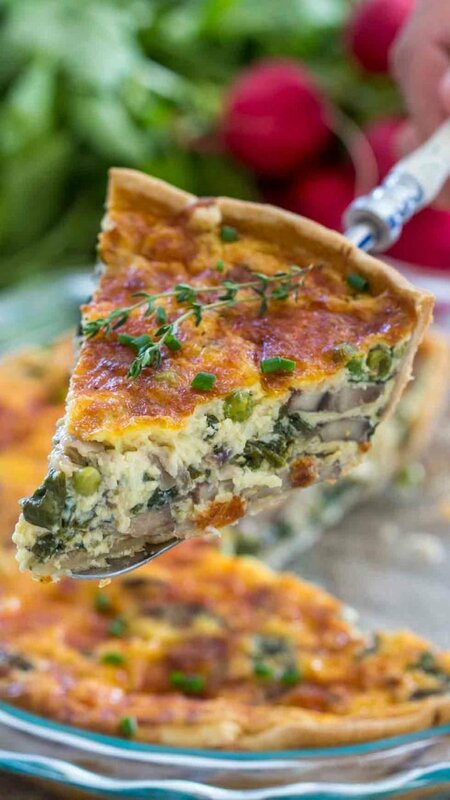 This Spinach Quiche Recipe is buttery, creamy and can be loaded with your favorite veggies. 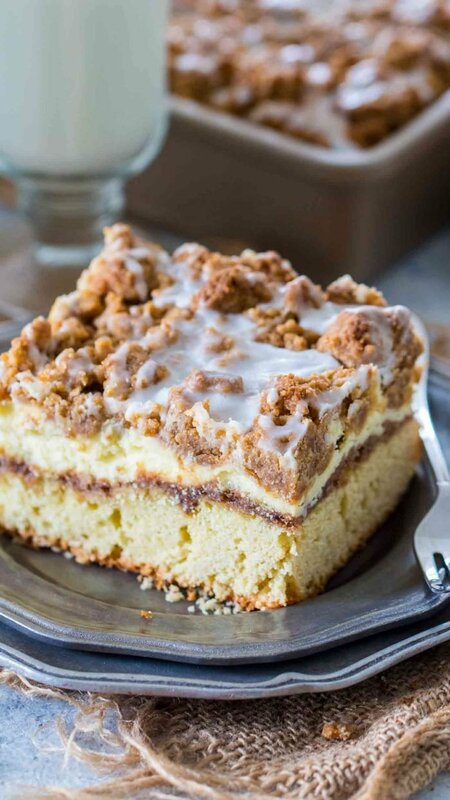 Perfect for a delicious make ahead breakfast and is super for brunch! 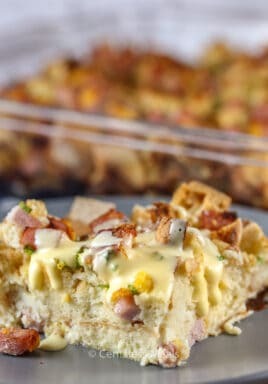 Quiche recipes are so versatile! Keep it simple with a traditional egg filling or use your imagination and jazz it up with your favorite veggies and meat! No matter how you dress it up or down, this Spinach Quiche Recipe is the perfect solution for weekend visitors! 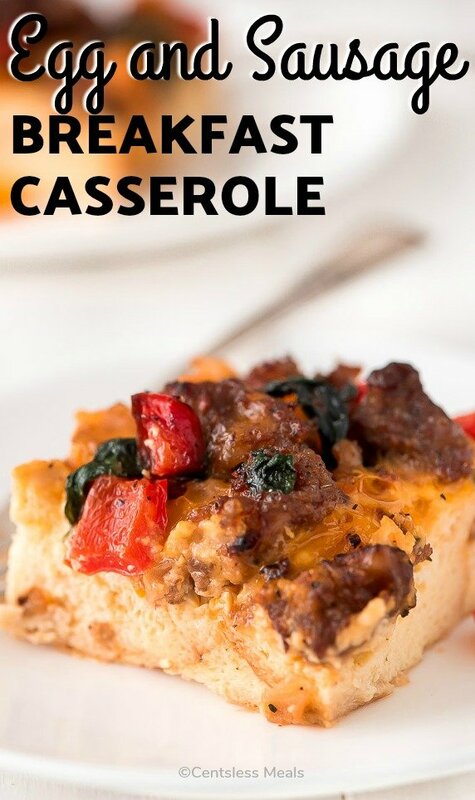 Or you can prepare it ahead of time and reheat for a quick breakfast during a busy week! While everyone keeps saying that breakfast is the most important meal of the day, most of the time I skip it. Its simple, I just don’t feel attracted to the usual quick breakfast meals like oatmeal or fried eggs. On the other hand, if you hand me this Spinach Quiche you can be sure that I will eat breakfast and even ask for seconds. You see, I have France in my heart, and when we visited Paris I was in breakfast heaven, almost every corner cafe was filled with delicious, fresh sandwiches on warm, crusty bread and a huge variety of quiche. It was like a never ending brunch date! 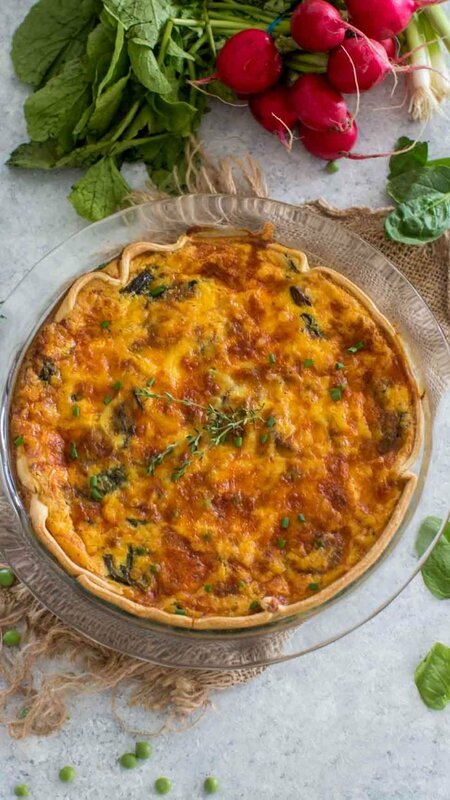 Spinach Quiche is one of my favorite recipes to make, I like the versatility of it, you can have the classic one, with just spinach, cheese and some sautéed shallots or you can load it with you favorite veggies and even some ham or bacon. This is the type of recipe that you can modify to suit your own liking. 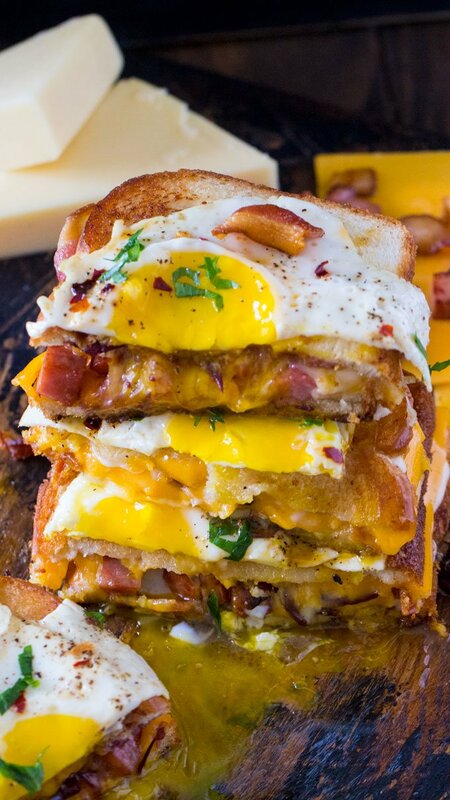 Its definitely one of those great make-ahead breakfast recipes. One quiche has about 6-8 servings, you can easily reheat it or just eat it cold. A pie crust – you can use a regular 9 inch pie crust, or you can use a deep dish pizza pie crust, depends how large/tall you want your quiche to be. I usually use 9 inch store-bought pie crust. You can make your own crust if you prefer so. Spinach – I prefer to use fresh spinach in this recipe. You can also use frozen. If you want to use frozen, you will have to plan ahead of time and defrost a 10 oz chopped spinach bag, squeeze of water as much as possible. I still like to sauté it, as it helps remove extra liquid and blend it with other flavors. Eggs – I like using organic, free-range eggs, as this recipe is so egg heavy. You definitely want eggs that will add a nice golden color and taste great. Cream – the quiche can be made with cream or whole milk, I prefer the cream, because it gives it a more custard like texture. 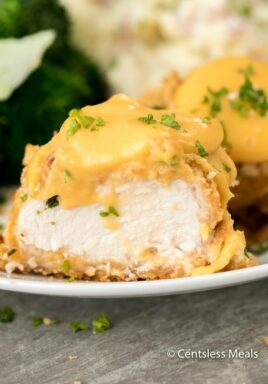 Cheese – the cheese is crucial, technically you can’t go wrong with any cheese, but remember that it will have a huge impact on the flavor and how the quiche tastes. For a more prominent flavor, you can go with sharp cheddar cheese or even blue cheese. For a milder flavor, and if you are looking more to make the quiche creamy and not as much to taste the cheese, mozzarella, Swiss cheese and Provolone cheese are great options. 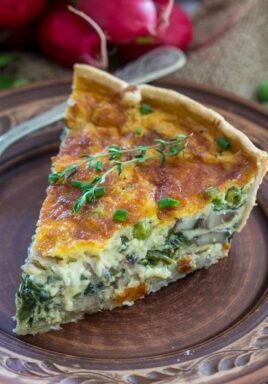 I love this quiche with Gruyere, I think its the perfect balance between creamy and also with a slight nutty and tangy flavor. For a spicier kick you can go for Pepper Jack cheese! As a rule of thumb, look for a creamy cheese. Bacon – cook in the pan first, remove and set aside and after that sauté the other ingredients. Cubed ham – great way to use leftover ham! 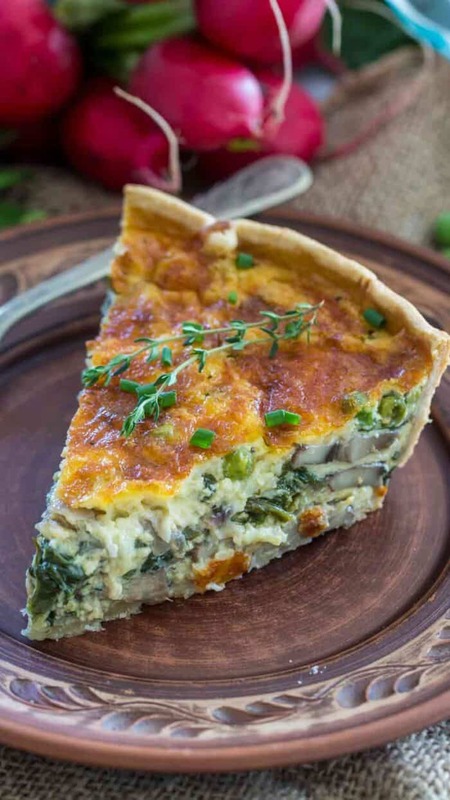 How to freeze uncooked spinach quiche – follow all the recipe directions and prepare the quiche filling, add the filling to the prepared pie shell. Place on a flat surface like a small tray or cutting board and transfer to the freezer. Once frozen, cover well with plastic wrap and aluminum foil or place in a freezer bag. Can be stored in the freezer for up to 1 month. You DON’T need to defrost the quiche in order to bake it. Preheat oven to 400 degrees F, cover quiche with foil and bake for about 50 minutes. Uncover and bake for another 10 minutes, until top is settled, not wobbly in the center and its a nice golden color. 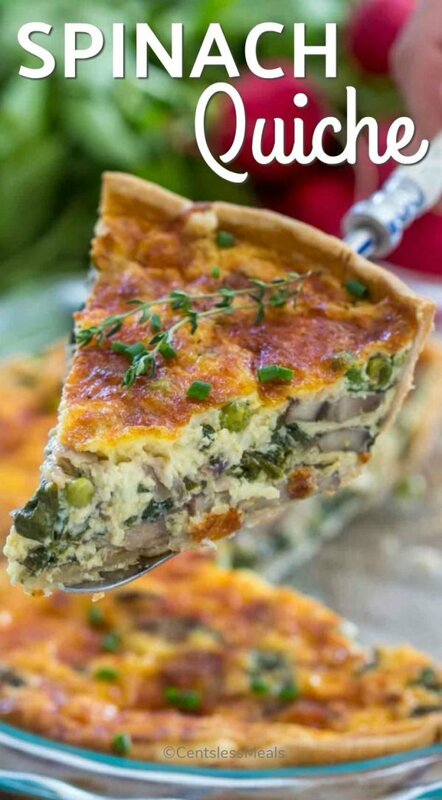 How to freeze cooked spinach quiche – you can freeze the quiche whole or into individual slices. Wrap quiche well in plastic wrap and aluminum foil. Freeze for up to 2 months. Do not thaw before reheating. Remove wrap and bake in a preheated 350 degrees F oven for about 30 minutes, or until heated through. You can use this recipe to make classic spinach quiche, just skip the mushrooms and green peas. You can use only 5 cups of spinach if you prefer less spinach, more egg custard filling, or you can add a few more cups of spinach. Once the oil is hot add the diced onion and minced garlic. Stir and cook for 1-2 minutes. 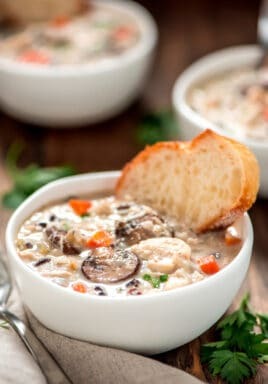 Add the sliced mushrooms and continue cooking for about 5 minutes. Stir occasionally. Add the fresh spinach and let it wilt for 1 minute. You can cover the pan with a lid for about one minute to speed up the process. Stir to combine, spinach should be reduced in size by now. Remove filling from heat. Add the pie crust to a 9 inch pie pan. Add the spinach filling onto the pie crust and distribute evenly. Top with 1 cup of shredded cheese. Sprinkle evenly over the filling. Top with the sweet peas if using. In a medium bowl, whisk together eggs, cream, salt, pepper, paprika and red pepper flakes until fully combined and well blended. Pour the mixture over the filling, using a spatula to distribute it evenly. Top with the remaining 1/2 cup of cheese. Extra cheese can be added on top. Cover with foil an bake for 45 minutes, remove foil and bake for an additional 15 minutes, until top is golden brown and the center is not wobbly. Remove from oven and you can either serve it hot, warm or cold. Garnish with chopped chives. Serve with a fresh salad on the side.